Armand & Albert,a middle-aged gay couple, reluctantly accept Armand's son's intention to marry the daughter of a conservative Senator, but when the fiancee's family comes to visit, the whole household is turned upside down. 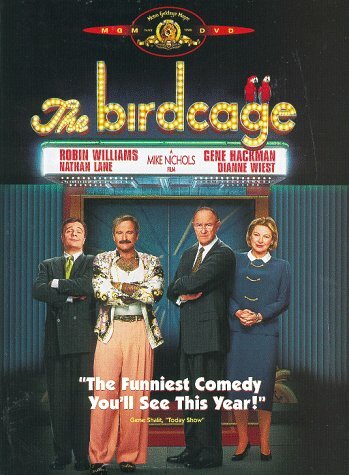 I have owned the MGM DVD of "The Birdcage" since 1998. I decided to watch it today and, after all this time, I STILL love it! The film boasts quality comedic characterizations, tight editing, vibrant wonderful color and music that captures not only the tropical flavors of the Florida coast, but accents the hilarious gems of irony that run throughout the whole film. Sure, there are a few minor missteps in scripting and line delivery. But, it's ENTERTAINMENT . . . NOT a socio-political treatise on the evolving state of the human condition. Those who try to find profound philosophy in fanciful farce will only meet up with disappointment. Those who feel compelled to (or rather obsessed with) making "play-by-play," nitpicking value comparisons of this remake to the original "La Cage Aux Folles" should lighten up. You might as well compare Little Women to Desperate Housewives . . . they just aren't meant to be mentioned in the same breath! I have watched the original AND the remake, and I can appreciate the merits and weaknesses of both. Each film expresses its own unique flavor and personality--playing off of and satirizing the popular contemporary cultural and historical context in which each was created . . . THAT is the attitude one should take when watching either of the films. *Movie Commentary--Maybe an audio conversation with the directors, cast key crewmembers as they watch the film (With Robins Williams/Nathan Lane in the "dish" mix, it could really be a funny, unique feature). *Cast, Crew interviews--about the production, their own process of characterization, technical effects, etc. *Outtakes/Deleted Scenes--we've heard there are SO MANY hilarious ones. We are dying to see what they are! "The Birdcage" earned more than $124 million in its theatrical release domestically, and over $61 million overseas. Not only is it a popular mainstay on various TV channels throughout the year (which means it must get a consistently good audience rating), but there is now widespread public acceptance of similar content in both film and TV. I am sure if whoever has the DVD copyright decides to make an anniversary / collector's edition of "The Birdcage", there will be many of us out here who would LOVE to buy it and recommend it. Fosse, Fosse, Fosse, Martha Graham, Martha Graham! i love this movie, it is my fav. Robin Williams can do anything and everything well. In this film, his aging homosexual role is understated. He's got the walk, the wrist, the clothes...he is the perfect stereotype of the older gay male. He's as funny as ever. Nathan Lane's tour de force as Williams' "wife" couldn't be funnier or, depending on how you view "the life", pathetic. He is a genius in this role and there are times you actually do think of him as a woman, especially when he tells Williams while folding laundry, "You never wanted to share your son with me." Agador, the barefoot half-naked Latino house-boy/girl, comes close to stealing the flim from Williams, an almost impossible feat, but he almost pulls it off, especially when he whines about not being able to take part in Williams' drag shows. Those too-short scenes are hilariously funny. Agador's role in this story at first seems peripheral but you realize quickly that it is integral to the entire gay scene and especially to this film. Agador's role rounds out the picture perfectly. Another hilarious scene is when Williams and Lane, about to be "interviewed" by Williams' straight son's future in-laws (Gene Hackman and Dianne Weist) who don't know they're a gay couple, come to call. But before they do, Williams tries to teach Lane how to be masculine in his walking, talking and tea drinking. Both men are brilliant in this blast of a scene. There is a scene where Williams is trying to teach one of his hired drag queens to show more enthusiasm in his dancing role for the drag club; in the scene, Williams takes off on one of his famous spontaneous stream-of-consciousness riffs that, unfortunately, only lasts about ten seconds but it is truly a riot. The Birdcage is a hilarious look at the life of a homosexual couple living above their club in Miami Beach. When their son comes to visit, he shares that he is engaged to be married and that his fiance's family is coming to meet them. The movie then centers around the hilarious transformation that the Goldman family goes through to "de-homosexualize" their home and appearances. The most admirable character in this movie is Albert, the overly dramatic and effeminate drag queen. He is beloved by everyone in the community, as demonstrated by his visit to the market, and doesn't abandon who he is even when the conservative Republican family comes to their home. Albert is not ashamed of who he is and doesn't change himself to please anyone else. I am loyal to the very first "La Cage Aux Folles" which came out in 1978, I have to admit. However, if I had been asked whom should be in a remake of this movie, I definitely would have put Robin Williams and Nathan Lane in it. Very well casted. I do think, however, that the acting on these two guys' parts was a little overdone. In the original, even though Ugo Tognazzi and Michel Serrault were very campy, it never seemed like it was overacted. Williams and Lane were a bit too much for me. One of the funniest comedies ever made, and one of my favorites! It never fails. No matter what mood I am in, this film can make me laugh till I cry. I can be in the nastiest, most foul mood ever, pop in this DVD, and laugh my head off. It never gets old, either. Watching the entire cast at the top of their game is quite a treat. Mike Nichols struck comic gold with this film in 1996. I saw it in the theatres when it came out, and it has been a favorite of mine ever since! Why this film wasn't nominated for several Oscars is beyond me. You'll never see a funnier comedy of errors than this! Well, some of you may disagree, but as far as I am concerned, this film takes the cake! For starters, we have a gay couple comprised of Robin Williams and Nathan Lane. Robin Williams (Armand) has a unique gift, for he can be both outlandish with his talent, or he can be subtle and understated. It is the latter quality which he brings to The Birdcage, with only small offerings of his more traditional high-energy humour, and he has a charm which endears him in every movie he appears in. Put him alongside the limp-wristed extrovert Albert (Nathan Lane), who screams when he damages toast, and you have a recipe for some outrageous comedy which director Mike Nichols stirs with an expert wooden spoon. In a nutshell, this unlikely couple must pretend to be man and woman to receive the parents of Armand's son's fianc¨¦ as guests for a first encounter. For, in a previous state of mind Armand did produce a son with a woman. The real twist is that the father of his son's fianc¨¦ is no less than Senator Kevin Keeley, played wonderfully by Gene Hackman. Not only must the fact that Armand is gay be hidden, but his partner Albert transforms into a woman in a way which the Senator finds appealing. A wig and and a dress is all that is needed for Albert, who given his nature is overly feminine anyway. The Senator mistakes this ludicrous man as being a stout, moral (if homely) looking woman and takes a liking to her. Mingle in an absolutely fall-over funny performance from Hank Azaria (who steals any scene he is in) and the stage is set for a very entertaining two hours or so. I loved the French film La Cage Aux Folles when it was made and The Birdcage is a wonderful remake. Both films are worth owning. Nathan Lane and Robin Williams need I say more! When the bird hits the fan. I have always loved Robin Williams and this is a classic. Nathan Lane is fall down hysterical as Albert. The supporting cast is superb. Hank who plays Agador nails it. THE BIRDCAGE is one marvelously entertaining and well done comedy. Based on the popular French farce LA CAGE AUX FOLLES, screenwriter Elaine May and director Mike Nichols have fashioned a hilarious tale of love, family and acceptance, infused with some uproarious scenes, superb acting and a heart bigger than all of Miami! The Oscars in 1996 ignored some of the best performances on screen: Nathan Lane is picture perfect as Albert, the feminine side of a relationship with the equally marvelous Robin Williams. Lane's portrayal is the heart of the movie, and Oscar blew it in neglecting a nomination. Likewise, Hank Azaria as Abagor Spartacus is just brilliant as their Guatemalan "maid", and he was sorely overlooked as well. How about the usually staid Gene Hackman bringing such intelligence and life to an otherwise obnoxious character--his getup in the end is priceless, especially when he moans that nobody wants to dance with him...and it's because I'm in white..I told them I looked fat in white!! Dianne Weist as his stuffy wife is great, as are Calista Flockhart and Dan Futterman as the youngsters involved. Futterman is especially impressive, and I'm surprised he hasn't had a better career.